Assam is a state in the northeast part of India. It is the heart of northeast India. Assam is well known for its wildlife and tea plantation. Assam is famous for one horned rhino, the Maa Kamakhya temple and the mighty river Brahmaputra. Japi, Gamosa and Xorai are the three unique identities of Assam. 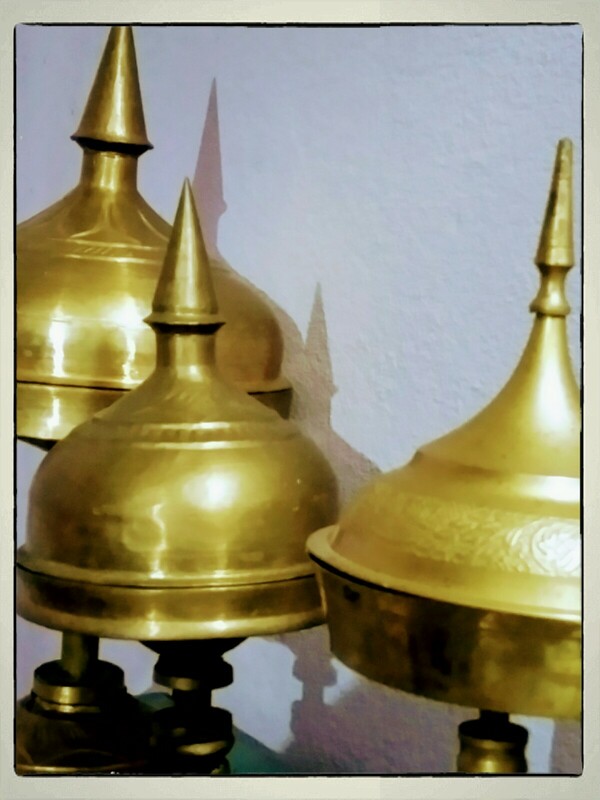 Japi (জাপি) is a traditional conical hat of Assam. Japi is made from the leaves of palm tree (টকৌ পাত) and bamboo (বাহঁ). There are two different types of Japi. One is plain and the other one is coloured(ফুলাম জাপি). Coloured Japi is made from the leaves of palm tree, bamboo, coloured cotton cloth, wool and mica. 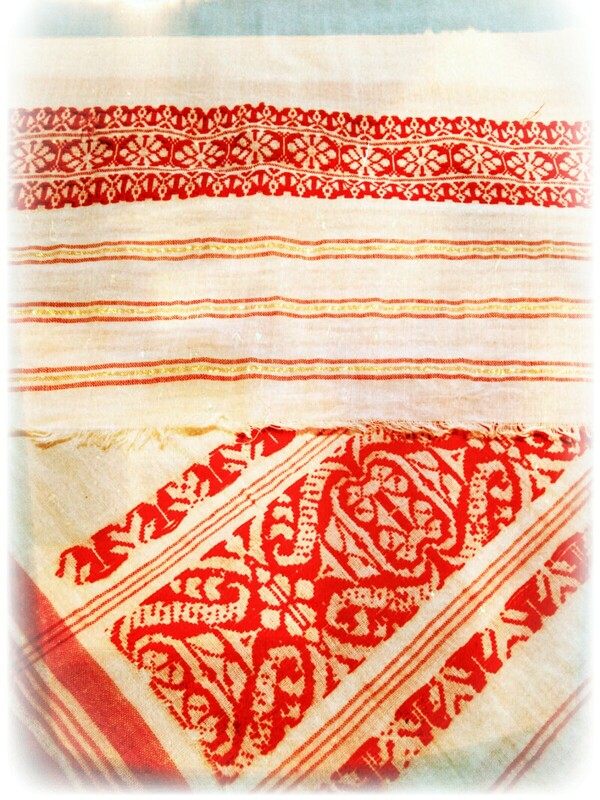 A Japi is a symbol of Assamese craftsmanship. 1. Plain Japi is used by the farmers during cultivation to protect themselves from rain or sun. 2. Coloured Japi is used as a prop in Bihu dance of Assam. 3. Some people use Japi as an decorative item in living room. 4. Japi is also used as a gift to honour someone or to felicitate someone. Gamosa (গামোচা) is a symbol of Assamese culture. It is a white rectangular shaped cotton or silk piece of cloth with red floral border in two sides. 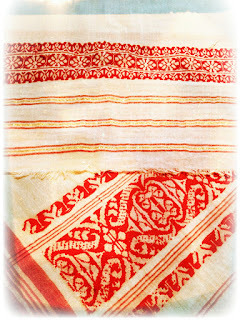 This two feet cloth has esteem and wide use in Assamese culture. The word 'ga' means body and 'mosa' means to wipe. So the literal meaning of Gamosa is something to wipe the body with. So it is used daily as a towel to wipe the body after bath. Beside this Gamosa has many other uses in Assamese Society. 1. Gamosa is used in religious ceremonies by the people of Assam. It is necessary to hung around the neck at the Namghar. 2. It is used by the male Bihu dancers. They wrap it in their head in Bihu dance. 3. Gamosa is used to cover the alter (Manikoot) at Namghar. 4. 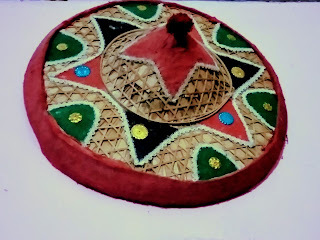 Gamosa is used as a gift (Bihuwan) in Rongali Bihu. 5. Gamosa is also used as a gift to honour someone or to felicitate someone. 6. Silk Gamosa is used by a groom. A groom hung a silk Gamosa around his neck in the marriage ceremony. 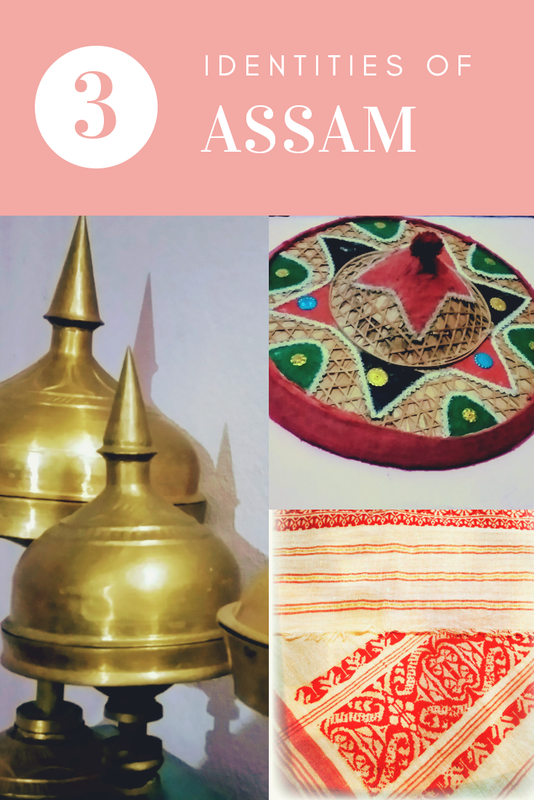 In every Assamese home Xorai (শৰাই) can be seen which is a traditional symbol of Assam. It is made of bell metal. There are many different sizes of Xorai. It is generally used as an offering tray. Some Xorai are with cover and some are without cover. 1. Small sized Xorai without cover is used as an offering tray of betel nuts and leaves (তামোল পান) to guests. 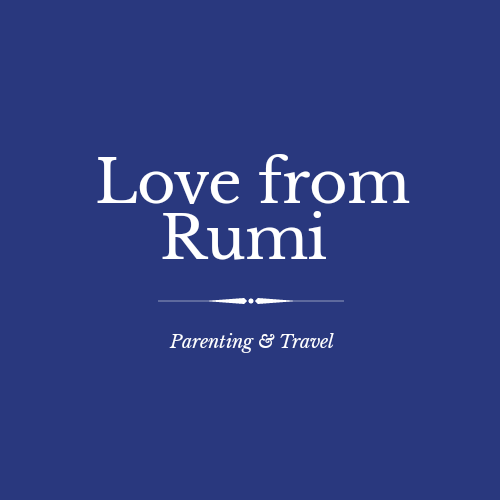 It is offered to welcome guests or after tea (চাহ-জলপান) or meal (lunch or dinner) . 2. 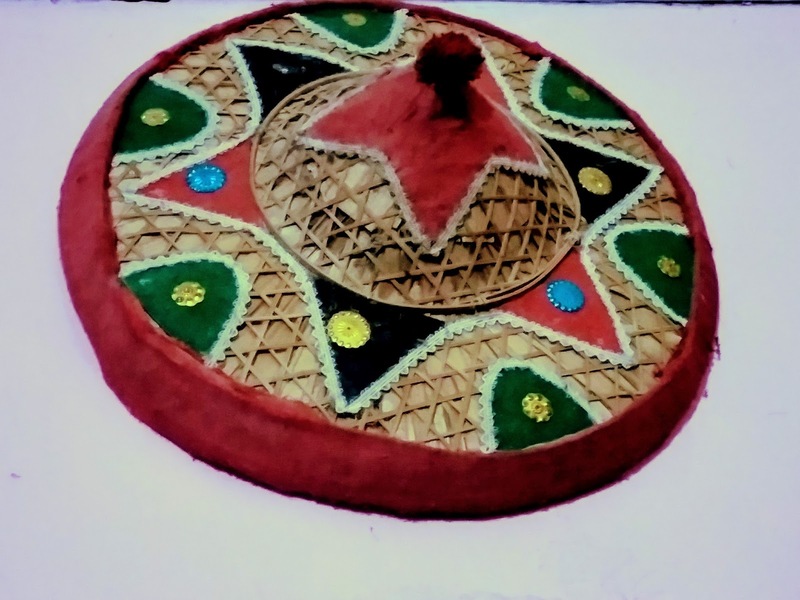 Big and medium sized Xorai are used as an offering tray in religious ceremonies to offer fruits and other items (মাহ-প্ৰসাদ) in front of the Deity or Namghar. 3. Some people used Xorai as a decorative item in living room. 4. Xorai is also used as a gift to honour someone or to felicitate someone.